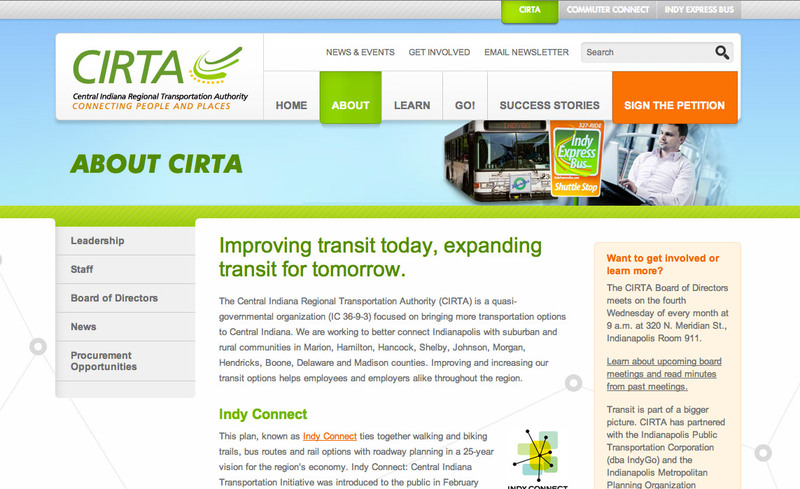 We launched a new website for Central Indiana Regional Transportation Authority (CIRTA) recently, and it can be viewed at http://www.cirta.us. CIRTA has been a long time client of TBH Creative. We developed their brand and first website in 2007. 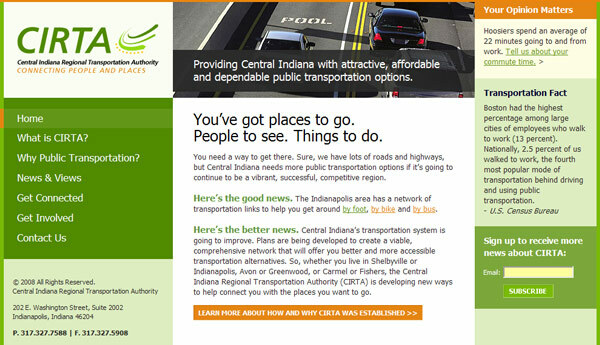 As they grew and acquired Central Indiana Commuter Services (CICS)--now Commuter Connect--it was time for an upgrade in web design and structure. We designed a new interface for a wider screen and more balance with brand colors and graphic appeal. We also installed our Content Management System with custom modules developed to suit their specific needs. Thank you Tatum! And just wanted to say, I love the look of our new website! Thanks so much on the awesome job you did on the CIRTA and Commuter Connect sites. You and your team were great. ~ Jen Schmits Thomas, APR, JTPR Inc.
CIRTA's website before the redesign. The Central Indiana Regional Transportation Authority (CIRTA) is a quasi-governmental organization (IC 36-9-3) focused on bringing more transportation options to Central Indiana. They are working to better connect Indianapolis with suburban and rural communities in Marion, Hamilton, Hancock, Shelby, Johnson, Morgan, Hendricks, Boone, Delaware and Madison counties. Improving and increasing transit options helps employees and employers alike throughout the region. CIRTA is constantly working with state legislators and community leaders to improve public transit. 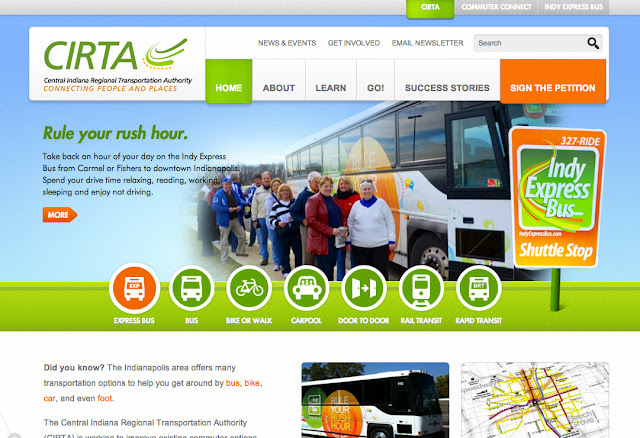 Sign the petition to support dedicated transportation in Central Indiana! Is your site in need of a website redesign? The experts at TBH Creative specialize in web design, online strategy, and social media. Schedule a web consultation to learn more about how we can help your organization succeed online.